If you don’t know where your task is, then you can’t say if your project is on schedule or not. All the planning in the world is useless if you haven’t set up a mechanism to track those tasks and know if the work is being completed or if team members are falling behind. First, let’s review terms. A task can be a to-do list of items. They are typically small, one action items that are required to accomplish a problem. In project management software, tasks are line items in a project plan with start and end dates added to build a project schedule. Tracking tasks is simply part of management. Think of it as a process by which you can follow a task through the lifecycle of your project. It involves more than just tracking, of course, but also planning, testing and reporting. A task needs tracking from all sides, which includes its status, priority, time, human and financial resources assignments, recurrence, notifications, etc. All of these states can be followed as you track a task, which is where our free Excel template comes in handy. It’s a repository for all that information and more. 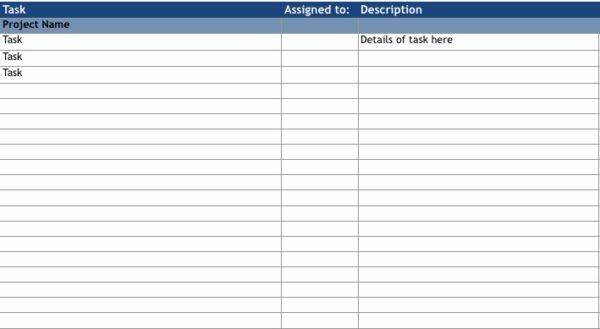 The task tracking template is easy to use. It’s fairly self-explanatory, but a brief walk-through the process is never a bad idea. The first column is the check-off, where you can mark that task as complete or not. It’s a good way to see at a glance where you are in the process, as well as a way you can filter your spreadsheet and determine how much work has been done and what’s left to do. The next column address the priority of the task. This is usually broken up into three divisions: high, low and medium. The priority column is a way for you to decide which tasks are most important and which could be left aside if time doesn’t permit them to be completed. It gives you an opportunity to organize your tasks and manage them for maximum productivity. Then comes the all-important deadline. You can’t manage a task if you don’t know when it needs completion. This is another way for you to prepare yourself by being proactive and taking note of the critical dates in your project’s lifecycle so you can manage the task list with foresight. Of course you have to have a task assigned to each line that then corresponds to the other columns in order for you to keep track of what you want to keep track of. Also, note who the task was assigned to. Someone has to take ownership of that job and be responsible, though the buck stops with the project manager. And finally write a short description of the task in order for both the team and stakeholder to be able to see at-a-glance what the task essentially is. Finally, you’ll want to have a column in which to collect any notes that may come up over the course of completing the task. There needs to be a column showing the percent complete to quickly see where you are with the task. A cost column will make sure you’re staying in budget, plus the planned versus actual hours are critical to making sure one task doesn’t hog all your time. You can create your own with ProjectManager.com or download this template and then once it’s filled in upload it to ProjectManager.com. When you move your static template to our collaborative online software that’s where the rubber hits the road in project management. Our tools allow you to view and report on a team’s progress and track their tasks in real-time. Teams can update their tasks as they finish them as long as they’re online, and everything is collected in one place to ensure that no bad intel corrupts the progress of your project. If you have our software, what you need to do is go to the main menu within ProjectManager.com. There, on the upper right-hand corner of the page, you’ll find a drop-down menu. Scroll down until you find import, and click on it. This will bring you to a new page, the import page, where there will be several options for you to import various reports to your project management software. Here you’ll also have the option to filter your content as you see fit. It’s simple and easy. You can view your document, share it with the team or stakeholders, as well as save it as a PDF, Excel, CSV or Office document. 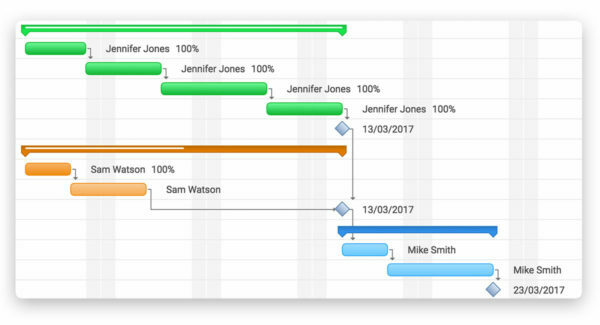 With your task tracking template now fully integrated into ProjectManager.com you can easily create a Gantt chart in which to have a quick, at-a-glance view of the progress of various tasks. 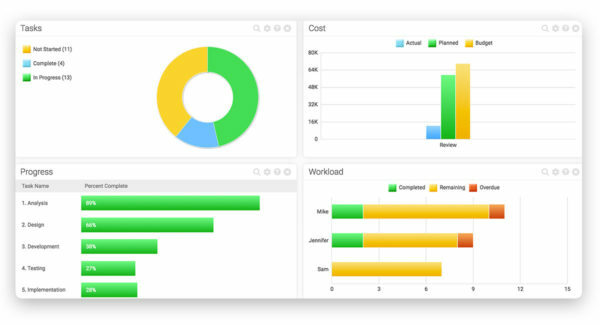 Through the ProjectManager.com dashboard, you can see in real-time the progress of your project and tasks, as well as drill down even deeper to see if there are any dependencies blocking the project and taking it off-track. You can also use the dashboard as a shortcut when generating reports for your team or stakeholder, sponsor or customer. The bold charts and graphs, once customized to target your audience, can be easily shared in a variety of formats. It’s just a keystroke away. There’s a lot of information on the topic of project and task tracking on the ProjectManager.com blog, which posts videos and articles every week. It’s a great resource for the “accidental project manager” as well as the experienced one. Here are a few of the more recent and relevant articles on the subject that add some depth and understanding. You can always dig deeper on the site if you want more to read or see. ProjectManager.com is not only a great software solution for tracking projects and tasks, but for managing every aspect of your project. It’s an online, cloud-based tool that fosters collaboration and makes sharing information easy for a more effective project. Collaboration is the oil that greases the wheels of teamwork and drives the project home to a happy and successful conclusion. There’s also the fact that you can view your project or projects via our dashboard and see how your team is progressing in real-time, so you can make the necessary actions to keep the project on track. From the dashboard view you can also easily generate all manner of reports to share electronically with the team and/or stakeholders. It’s that easy. So, what are you waiting for? If you’re still skeptical or prefer to stick with paper and pencil to try and keep your project under control, all we ask is that you take ProjectManager.com out for a spin and kick the tires. See how it works for you in the field. We’re so certain that the software will make managing your projects easier and more efficient that we offer a free 30-day trial. Visit ProjectManager.com and sign up for the freebee and see if you aren’t convinced and as excited by our product as we are. Hope to see you soon!